We are a Panama City Beach Dolphin Tour and Boat Rental company. We are only 10 minutes to Shell Island and will show you awesome time on your Panama City Beach Vacation. Flippers is owned by Caleb Ford a proud resident of Panama City Beach since 1996. He received his captains license in 2004 while gaining experience working with various Jet Ski Rental and Dolphin Tour companies in the area.But in 2006 a change was needed, and that change was the opening of Flippers Boat Rentals and Dolphin Tours in the St. Andrews State Park. After 6 years at the Park Caleb and his team moved to a new location just East of Captain Anderson’s. Caleb and the entire Dolphin Tour Guide team are still dedicated to providing outstanding service and the best in Dolphin Tours to Panama City Beach Vacationers. We are looking forward to seeing you soon! 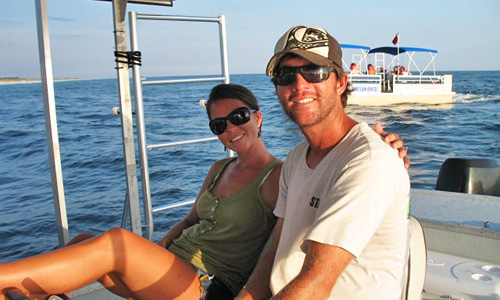 Flippers captains and tour guides are friendly, experienced and safety minded. Our goal is to give you a thrilling experience on the water, swimming with the dolphins and exploring all while keeping you safe. I have always enjoyed interacting with our customers and appreciate the relationships and friendships we have built together.